After topping the charts on Tuesday, Helio Castroneves had a reversal of fortune on Wednesday afternoon at the Indianapolis Motor Speedway. Actually it was a Richter scale shocker to be exact. Just one lap into practice, Castroneves lost control of his Team Penske Chevrolet in turn one and made heavy contact against the wall in the south short chute. The momentum created from the machine riding along the wall caused the car to become airborne and flip over, sliding on the track upside down before flipping back onto its wheels and coming to a halt in turn two. The three-time Indianapolis 500 champion, exited the car under his own power and walked into the ambulance. The Brazilian was checked out at the infield IU Health Emergency Center where he was cleared to drive. 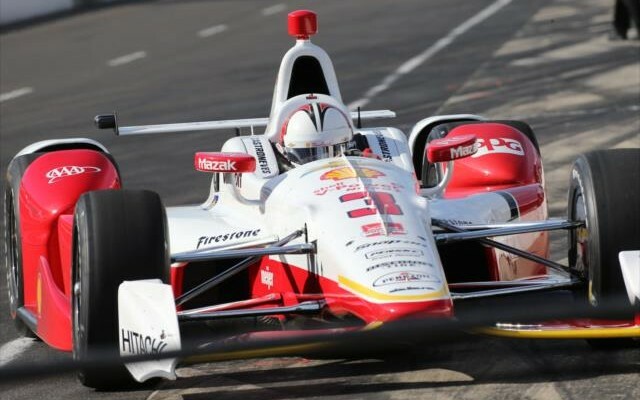 Despite a lengthy repair, Team Penske managed to roll out a backup machine for Castroneves, who returned to the track during Happy Hour to post a lap over 225 MPH, a decent recovery to end the day. Castroneves was saved from suffering injuries when the car landed upside down on both on the television roof cam above the air intake and on the rear wing. Castroneves’ helmet never came into contact with the ground whilst upside down. 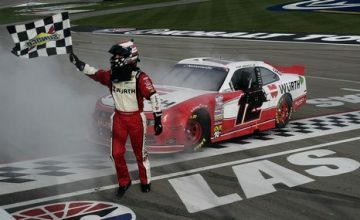 The accident occurred despite the Verizon IndyCar Series mandating the addition of a wicker strip on the front nose of the cars to prevent the vehicles from getting airborne when spinning backwards. The wicker appeared to initially work before the wheels became entangled with the outside wall as mentioned previously. 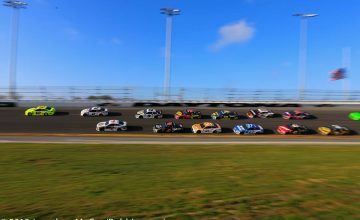 Team owner Roger Penske said the team is investigating the cause of why the car became airborne and if any extra measures can be taken to prevent a further issue later this month. For Castroneves, accidents at the Brickyard have been limited. As a rookie in 2001, he made contact with the wall twice during practice, the second of which saw him comically repainting the wall after hours after the incident. Of course, the Brazilian recovered from the shunts and won the race to wrap up the month. His most recent accident prior to Wednesday came in the 2006 Indianapolis 500, when he made contact with Buddy Rice, sending both entries into the barriers at turn four. As for the remainder of Wednesday attention, the focus was on the speed Andretti Autosport’s Carlos Munoz showed in drafting mode during the final hour of action, becoming the first driver this month to exceed 230 MPH. Topping out at 230.121, the effort marks the first time a Honda-powered entry has led a daily speed chart. Indy-only driver Townsend Bell also continued to show pace for the second consecutive day as his No. 24 Dreyer & Reinbold-Kingdom Racing Chevrolet entry was just under 229, with Chip Ganassi Racing’s Tony Kanaan third at over 228. Dale Coyne Racing’s James Davison and Kanaan’s teammate Sage Karam rounded out the fast five overall on the day, but there is a semi-asterisk next to the efforts by Davison. The Australian sophomore is scheduled to race for TRG-Aston Martin Racing in the Pirelli World Challenge series this weekend in Canada and will be unable to be present at Indianapolis to qualify his No. 19 Honda entry. As a result, Tristan Vautier will be called upon to qualify the entry in place of Davison this weekend. If all works out, regardless of where Vautier ends up in the final order, Davison will have to start last in the Indianapolis 500, due to regulations involving the changing of drivers. Davison’s teammate Pippa Mann was the second driver to crash on Wednesday, spinning in turn four and making contact with the pit road attenuator. Mann suffered no injuries in her incident and like Castroneves was cleared to drive. While Honda looks strong overall in draft mode, Chevrolet continues to control the proceedings in terms of fast laps posted without the help from another car. Chip Ganassi Racing’s Scott Dixon was first on the list at 226.411 MPH, with CFH Racing’s Ed Carpenter and J.R. Hildebrand the only others credited with laps in the 226 MPH without aid.